The brand new Specialized Turbo Levo is here! Development of the humble bicycle has moved forward in leaps and bounds over the last few decades with carbon fibre frames, hydraulic disc braking and electronic shifting now a regular presence on roads and trails across the UK. But while we’ve seen huge improvements to everyday bikes, no sector has developed quite so rapidly as the electric bike sector. With a rampant pace of innovation, these bikes are getting more reliable, more rideable, and better looking with every new iteration, and interest in going electric has sky rocketed as more and more riders understand the benefits of doing so – travel further for less effort, climb quicker, and make more of your time on the bike. At the forefront of electric mountain bike development have been Specialized with their Turbo Levo platform. Without a doubt one of the best looking bikes on the market, the Turbo Levo paired sleek integration with excellent ride quality to redefine how an e-bike should look, feel and ride when it was originally released back in 2015, and over the last few years other manufacturers have started to catch up to the benchmark that the original Levo set. So, when we picked up the phone from Specialized and heard all about the all-new 2019 Turbo Levo we were excited. Like, REALLY excited. With a new, lighter frame design, bigger battery capacity and brand new motor the new Turbo Levo looks set to once again rip up the rulebook for electric mountain bikes. With all this new-ness, where do we start? First of all, let’s dive into all of the next level e-bike technology that the new Levo boasts, and Specialized have partnered with Brose on the new 2.1 motor. Previously, the Levo’s motor was encased in aluminium but for the new model it’s now wrapped in magnesium to save weight – and contributes to a whopping 400g weight saving over the old motor, bringing the weight down to 3kg with the same 250W power. The footprint of the motor has also shrunk, with it now taking up 15% less space than the outgoing unit. In fact, the Brose 2.1 motor is the most lightweight, powerful motor out there – that’s to say that there are lighter motors that aren’t as powerful and more powerful motors that aren’t as light, but nothing touches the Brose when it comes to combining those two key characteristics. The power curve has been remapped too, so the 2.1 is equal to or better than every other motor available at all cadences in terms of power delivery. Working with Brose on the development of the new motor has also allowed Specialized to optimise the bike itself to match the performance of the new motor. Previously the bike has had to be built around the motor, but starting from scratch with Brose has meant Specialized have been able to design the motor around their bike. Doing this means that the mounting system has been optimised and shaved some weight off the bike overall, and on the carbon models the motor now bolts directly to the frame rather than sitting within a cradle which helps save even more weight. The new motor, however, isn’t proprietary to Specialized and other companies will be able to use it – but because of their involvement in the development, it’ll mean that any other manufacturers have to basically design their bike in the same way as Specialized. The brains of the bike (which were previously linked to the battery) have a new home on the 2019 Turbo Levo, shifting to the Turbo Connect Unit, or TCU, on the top tube. Not only does this move make the whole system more efficient, it puts control of modes and battery percentage right in front of the rider. This new unit can connect to your phone or any other devices via Bluetooth and ANT+ and uses a Micro-USB for all in-store updates, and is waterproof to IPX7 – more than enough to handle even the wettest of British riding. The same three modes – Eco, Trail and Turbo – are still available via the handlebar remote but a further two modes, Stealth and Shuttle, are now available through the updated Mission Control app. Shuttle turns the peak power output all the way up so you can get back to the top of a run even quicker with minimal effort, while Stealth mode turns all of the lights on the bike off if you’re riding in the dark, or don’t want to shout about riding an electric bike. Given the sleek new design, once the lights are off you’d be hard pressed to tell the new Levo apart from both of the other bikes out on the trails. The other big piece of tech news for the new Turbo Levo is the introduction of a new, bigger capacity 700Wh battery for the Expert and S-Works models, with a redesigned 500Wh battery for the rest of the range – that’s an increase from 504Wh and 460Wh respectively. Both batteries contain 40 cells but those cells are longer in the 700Wh version, helping create some of the extra capacity, while the redesigned enclosed downtube also means the battery can be longer. The larger capacity battery is only 40g heavier than the 500Wh version, but gives 40% more range, and Specialized have even created their own Turbo Calculator so you can work out how much battery you’re likely to use on each ride just by plugging in your bike, weight, height, modes and terrain. Both batteries are the same in terms of dimensions and the 700Wh batteries will also be available separately, so if you opt for a cheaper model you can always increase your range down the line. 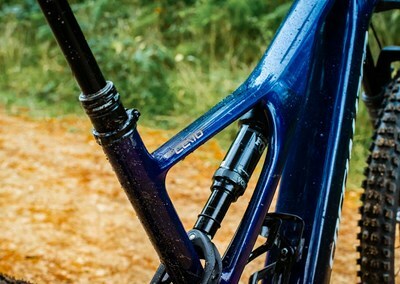 But the changes aren’t just limited to electric tech on the new bike – the new Levo gets a brand new frame amongst plenty of other cues borrowed from the redesigned Stumpjumper that was released earlier this year. The most obvious of those changes is the new asymmetric frame design which boosts overall stiffness so weight can be saved elsewhere, paired up with a smaller cross-section downtube. Less visually obvious is the fully enclosed downtube which the battery slides inside. This new design means that the tube is self-supporting and doesn’t need overengineering on the inside to accommodate mounts for the battery as on the outgoing model. Now, the battery simply slides into the downtube from the bottom bracket. This new frame design is present on both the carbon and alloy models, and equates to a whopping 800g saving on the carbon model and 600g saving on the alloy range. Add in to that the lighter weight motor and the top of the range S-Works model comes in with a total bike weight just over 20kg – close to a 2kg saving over the outgoing version. The new bike also has an updated geometry with a 455mm reach which sits 20mm longer than last year’s model and 10mm longer than the Stumpjumper, and a slacker 66 degree head angle. This new geometry puts the Levo between the Stumpjumper and Enduro in terms of handling and ride feel, but also picks up the Flip Chip from the Stumpy which allows you to raise the bottom bracket by 8mm and steepen the head angle by 0.5 degrees. The new Turbo Levo also switches from 27.5” to 29er wheels across the entire range, creating a fast rolling planted feel, with a lower effective bottom bracket height to improve handling. Also borrowed from the Stumpy is the metric shock, with the Levo receiving an electric bike specific RX tuned shock. The future of electric mountain bikes? The sum of all this work? Not just a new bike, but a completely new benchmark for electric mountain bikes. With the sleek integrated downtube, lower weight and improved handling, the new Turbo Levo doesn’t just look more like a standard mountain bike – it rides like one too. With unrivalled stock of the new Turbo Levo, you'll be able to see the new bike in the flesh across our store network and at our dedicated E-Bike Centres. Home Latest News & Updates at Rutland Cycling The brand new Specialized Turbo Levo is here!